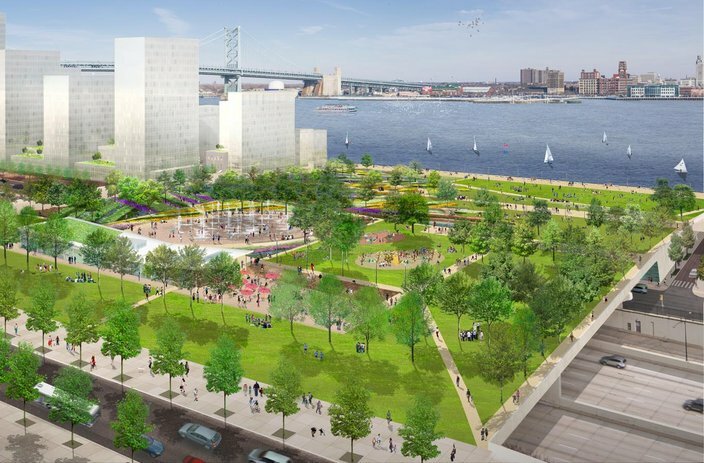 An artist's rendering of the proposed redevelopment of Penn's Landing. 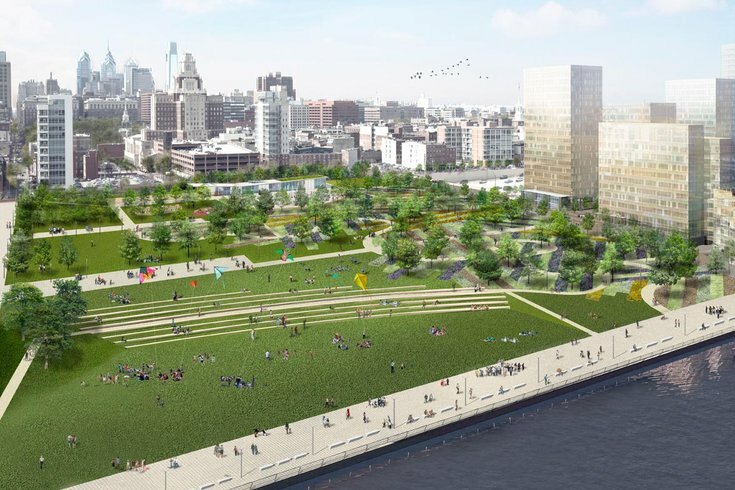 Nearly three years after a feasibility study painted a picture of a potentially big makeover for the Delaware River waterfront, Mayor Jim Kenney reportedly plans to begin setting aside money to make the plan a reality. PlanPhilly reported that in Kenney's budget address to City Council Thursday, the mayor will call for a $90 million city commitment to a proposed park that would cap I-95 between Walnut and Chestnut streets. 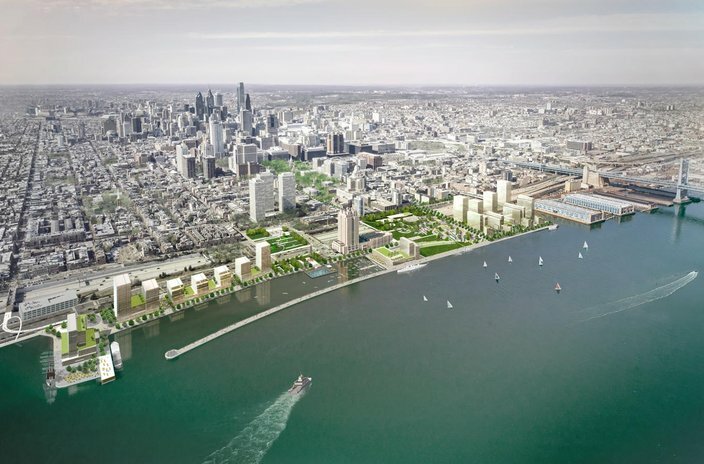 Kenney told the website Philly has "never met our potential" in waterfront development. He said the money would be stretched out over six years, and that the rest of the projected $225 million needed to finish the project is expected to come from the state and wealthy donors. 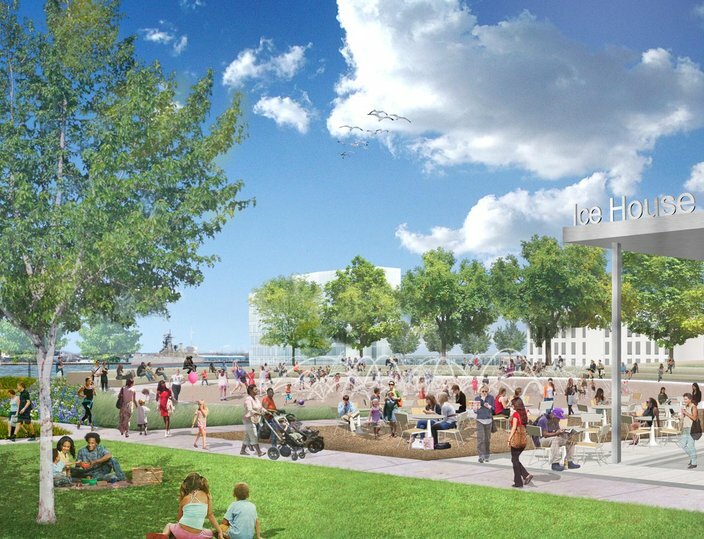 Hargreaves and Associates first came to the Delaware River Waterfront Corp. with a study and outline for redevelopment of the area in April 2014. The landscape architectural firm said its plan would eventually spur $1.8 billion in economic growth. At the time, it was projected that some of the private investment projects — new residencies, hotels and retail spaces — would take up to 35 years to fully complete. The park, however, would take about five to seven years to finish. 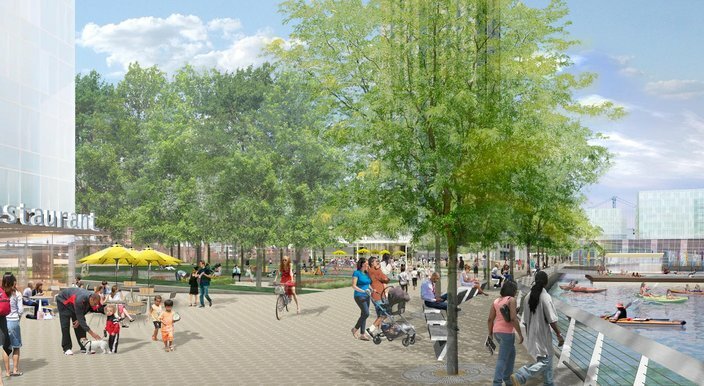 On Monday, Anne Fadullon, Philly's director of planning and development, wouldn't give PlanPhilly a timeline for expected completion of the park. Kenney told the website the project would provide recreational opportunities for families who can't afford to leave the city during the summer for other trips, such as going to the Jersey Shore. 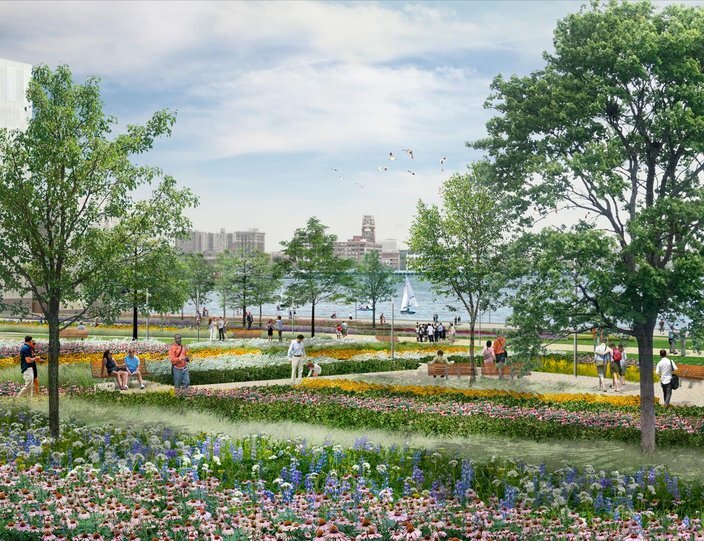 On its website, Hargreaves and Associates describes its plan as a "21st century urban park that will catalyze the creation of vibrant waterfront neighborhoods." The plan not only caps I-95 with a new green space but includes improvements for the entire stretch of Penn's Landing, which is owned by the city (city ownership of the area allows for a unique development opportunity, as other sections of the waterfront are privately owned). You can view more photos of the plan here, and you can read more from PlanPhilly here.